1 Vestiges of a moat surrounding the hermitage. 2 The moat has been resurveyed. 3 The moat has now been filled in. Findspot - a Palaeolithic handaxe was found 800m south east of Wolvey Heath. The possible site of a Post Medieval punishment place where Lady Smyth was burnt at the stake. The site is suggested by documentary evidence and is situated to the south of Wolvey Heath. The site of an enclosure of unknown date. It is visible as a cropmark on aerial photographs. The site is located 300m north of Smockington Lane. The possible site of an enclosure which is visible as a cropmark. It is of unknown date. The site is located 300m north of Smockington Lane. The site of a Medieval moat, a wide ditch usually surrounding a building. The moat survives as an earthwork at the southern end of Admington village. Site of Possible Moat at Moat House Inn, King,s Coughton. The possible site of a moat, a wide ditch usually surrounding a building, of Medieval or Post Medieval date. The site is located at Moat House Inn, King's Coughton. Site of Manor House at Orig. Site of Cookhill Prior, Spernall. The site of a Post Medieval manor house. All that remains is a platform, possibly surrounded by a moat. 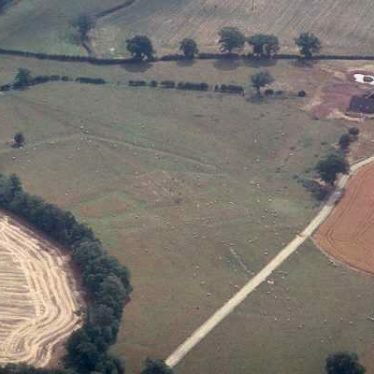 The site can be identified from aerial photographs, and remains visible as an earthwork. It is situated 350m north west of Morgrove Coppice, Spernall.